Lately I get more messages in my inbox from people trying to sell me yoga stuff than real student inquiries. Offers of anything I can possibly need for a successful yoga practice. But to achieve yoga we are told we need to give up everything. Yoga texts clearly indicate that all desires must be dissolved. So what are we selling? 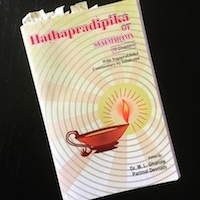 QUOTES — from Hathapradipika of Swatmarama, 10 chapters by The Lonavla Institute, pages 16 & 17. Radhasri (Rhonda Fogel) has been teaching yoga in Canada since 1998 and is the founder of Hatha Yoga Shala currently based in Montreal.